The Battle For Art! 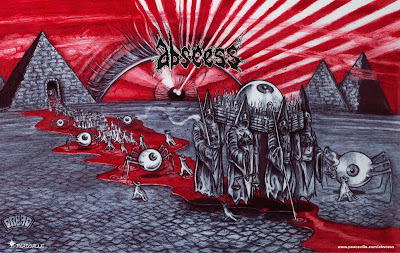 : NEW ABSCESS ART UNVEILED! More color art in the future, Dennis. There better be posters or a gatefold of this!!!! I DIG! The procession as well as the red sky reminds me of the "home world" in PHANTASM. Very, very cool, Herr Dread. And I can't wait to hear this new ABSCESS! Tell Chris R. I gave him a "shout out" in CREEPY CRAWLS ... HA!